The Global Volcanism Program has no activity reports for Ipala. The Global Volcanism Program has no Weekly Reports available for Ipala. The Global Volcanism Program has no Bulletin Reports available for Ipala. Ipala is a small but prominent stratovolcano that extends nearly across the full width of the Ipala graben and rises 750 m above the graben floor. Its summit is truncated by a 1-km-wide crater whose steep, 150-m-high walls tower above a lake. A prominent parasitic cone, Monte Rico, is located on the southern flank; it and other cones on the northern flank lie along a N-S-trending fracture that continues well beyond the volcano's southern flank. The eastern flank is cut by a 17-km long, NNE-SSW fissure that produced a conspicuous line of Holocene cinder cones that fed basaltic lava flows covering about 20 km2. Diaz reported that in 1865 Ipala ejected ash from 24 January to June; he listed no source and the report seems improbable (Incer 1988, unpublished manuscript). The Global Volcanism Program is not aware of any Holocene eruptions from Ipala. If this volcano has had large eruptions (VEI >= 4) prior to 10,000 years ago, information might be found on the Ipala page in the LaMEVE (Large Magnitude Explosive Volcanic Eruptions) database, a part of the Volcano Global Risk Identification and Analysis Project (VOGRIPA). There is no Deformation History data available for Ipala. There is no Emissions History data available for Ipala. 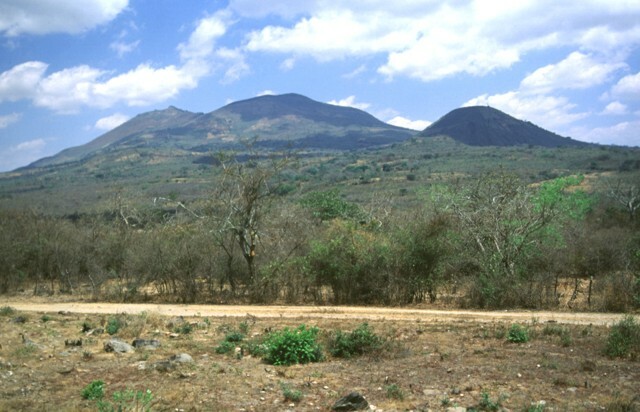 Ipala is part of a cluster of closely spaced small stratovolcanoes and cinder cone fields in SE Guatemala. The summit of the 1650-m-high stratovolcano is cut by a 1-km-wide crater containing a lake. The eastern flank of the small stratovolcano, seen here from the SW, is cut by a line of Holocene cinder cones and lava flows. Monte Rico is the prominent cinder cone on the south flank (right skyline). No historical eruptions are known from Ipala. Ipala is a small but prominent stratovolcano that rises about 750 m above the floor of the Ipala graben. The volcano extends nearly across the full width of the graben. The prominent satellitic cone in the shadow at the right is Monte Rico, on the southern flank of the volcano. 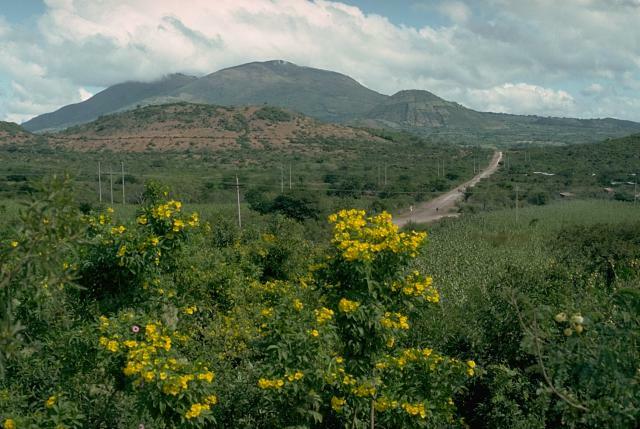 The eastern flank of Ipala is cut by a 17-km long, NNE-SSW-trending fissure that produced a conspicuous line of Holocene cinder cones and lava flows, out of view to the right. 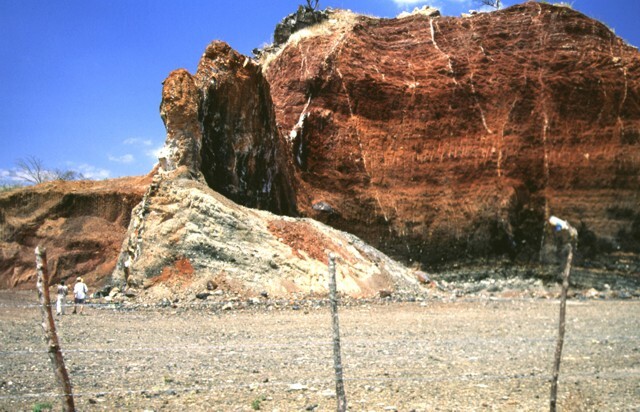 Volcanic dikes of varying orientation cut oxidized reddish scoria in a quarried cinder cone near the village of Agua Blanca. Several generations of thin dikes are visible (note people at the lower left for scale). The larger dike supporting the pinnacle at the left-center is oriented north-south, parallel to the direction of faults defining the Ipala graben. There are no samples for Ipala in the Smithsonian's NMNH Department of Mineral Sciences Rock and Ore collection. IRIS seismic stations/networks Incorporated Research Institutions for Seismology (IRIS) Data Services map showing the location of seismic stations from all available networks (permanent or temporary) within a radius of 0.18° (about 20 km at mid-latitudes) from the given location of Ipala. Users can customize a variety of filters and options in the left panel. Note that if there are no stations are known the map will default to show the entire world with a "No data matched request" error notice. Large Eruptions of Ipala Information about large Quaternary eruptions (VEI >= 4) is cataloged in the Large Magnitude Explosive Volcanic Eruptions (LaMEVE) database of the Volcano Global Risk Identification and Analysis Project (VOGRIPA).